Out of True is a world knocked off-kilter by love, both in its giving and its absence. 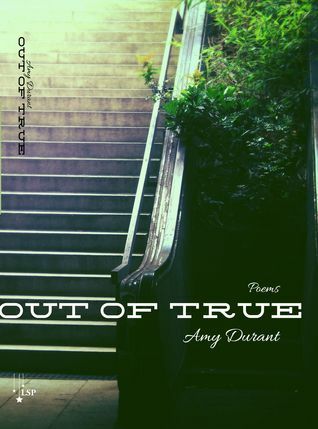 "You don't want me to write about you," Amy Durant says in "Palimpsest," when it seems that what the speaker would like to say is, "I can't stop writing about you, and to be honest, it's kind of doing my head in." I don't want to make the assumption that Durant's poems come from a personal place, but whoever is speaking within them had to work very hard at moving past a life-altering, unbalanced relationship. Still, as is the case with most big loves, one never completely lets go. fills in the gaps. Your brain does this. You're along for the ride. from "The Science of This"
There are so many lines in Durant's poems that feel so true and can be tied to my own memories. She has great insight into love and heartbreak, and also the bewilderment of our own making. I know how easy it is to tell myself that I will no longer care in the same way I once did, or that I won't let it bother me that I care far more about someone/thing than others, but I'm only semi-successful. "I loved you at temperatures beyond all that is rational," she writes. I know that love. from "REM Sleep. March – September"
The early loves are perhaps some of the most difficult. It's before we know fully who we are and what we want and how we should treat each other. It's too easy to get it wrong, even when our self-awareness advances. Other poems talk about love gone right, the love that happens after a disaster, the steadier kind. She writes of forgoing the idea of a perfect house, of learning to be around children, and of being happy as long as two people support each other. It's nice to read, that the poems aren't so singularly focused that they dwell. One big love does not mean that the big loves are singular in occurrence. Durant has many good bits, but she sometimes tries too hard to neatly end poems. More than one, I wanted to trim the last line or so, as they lessened the impact of the whole poem. Every once in awhile, she falls into what I like to call "Poetry Slam-Style Metaphor Overkill," where one moment "you" are fire, then rain, then "I" am in a Venn diagram, then a labrynth — all in rapid succession. For me, it's an unfocused way of saying, "Look! Watch me write!" It's an easy temptation. Still, Out of True is a very enjoyable collection of poetry in a pocket-sized edition, and one that makes me eager to read Amy Durant's other and future work. You should too. Full Disclosure: This book was sent to me as a review copy from the author. I thank her for the gesture, and I will continue to be fair with my reviews.